The BARKA Foundation has received first-hand information from a soldier who was in Naaba Koom at the time of the assault against the last die-hards of the RSP who refused to drop their weapons. He informed a BARKA staffer that just before the soldiers advanced, they were read an excerpt of a speech by Thomas Sankara (copied below), about how “…the slave who does not organize his own rebellion deserves no pity for his lot. He alone is responsible for his misfortune if he harbors illusions in the dubious assurance of a master’s promise of freedom…” The slave here of course was referring to RSP soldiers still clinging to the corruption and privilege they received under the Compaore regime. After the speech was read, the soldier said they were all ready to go and fight. It was very emotionally charged. As everyone now knows, they advanced without meeting resistance from RSP. The army solders from Bobo Dioulasso, who held a grudge against the RSP since 2011 when some of their soldiers were killed by RSP troops during a popular uprising (which sprang from social protests over the student killed in Koudougou), wanted desperately to be in the front line. As cool reason thankfully won over hot headed revenge, they were placed in the last ring of soldiers behind those of Fada, Kaya and Dedougou. The army personnel who were taken hostage by the RSP when they tried to carry out their orders to lead the disarmament, were freed without harm. No one was killed in the assault. The shelling that had occurred earlier had hit only uninhabited buildings. Although no deaths were reported, the soldier which BARKA’s staffer spoke to confirmed that the renegade leader of RSP’s final attempt to cling on to power had shot and killed some of his own band– RSP soldiers who had wanted to turn themselves in at the last moment, who had come to their senses. We are unclear how many RSP soldiers were killed, or whether they are included in the final official death toll which stands at 15, with 230 wounded. Even so, the government’s statement that there were “zero deaths and zero injuries” seems to not quite tell the whole story. One official statement from an Army spokesperson said there were no casualties because the last of the recalcitrants left before the army got there, fleeing either by motorcycle or by foot. The soldier BARKA spoke to confirmed that some RSP soldiers were still on the loose. He also informed us that as these soldiers were caught and rounded up, they were beaten. If these fleeing RSP soldiers were unfortunate enough to be found by the soldiers from Bobo, they were beaten badly. The New York Times reported that an army spokesman said that only 15-20 soldiers soldiers of the guard unit which once numbered 1300 refused to disarm. Lastly, as late as October 6, BARKA received an update from the US Embassy that people should continue to avoid the area of Ouaga2000, especially around camp Naaba Koom, because the army was detonating artillery munitions that did not go off when fired in the three salvos made before soldiers advanced. 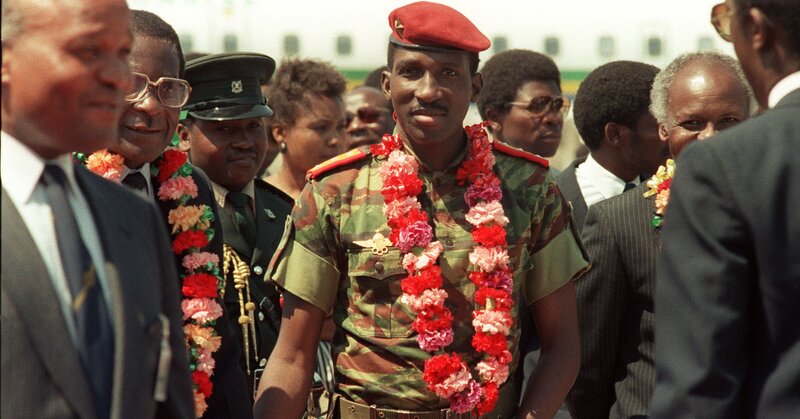 Below we reprint excerpts from the speech “Freedom can be won only through struggle” by Thomas Sankara, a leader of a democratic and anti-imperialist revolution in Burkina Faso (formerly Upper Volta) from 1983 until his assassination in a counterrevolutionary coup in 1987. 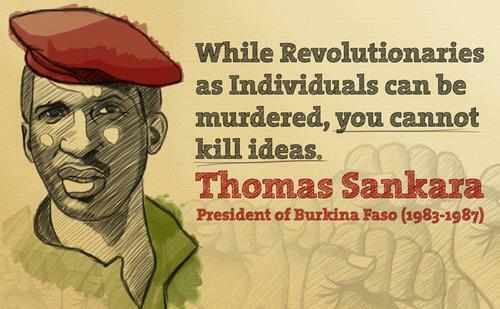 Sankara presented this speech to the United Nations General Assembly in October 1984. The struggle Sankara led to begin the transformation of Burkina Faso, one of the poorest countries in the world, provides an example to toilers in Africa and elsewhere of how social and economic advancement for the overwhelming majority is possible only through struggle against the imperialist system that breeds underdevelopment and misery. The excerpt is taken from the book Thomas Sankara Speaks, copyright (c)1988 by Pathfinder Press. Reprinted with permission. A few simple facts serve to describe the former Upper Volta: A country with seven million inhabitants, more than six million of whom are peasants; an infant mortality rate estimated at 180 per 1,000 and an illiteracy rate of up to 98 percent, if we define as literate someone who can read, write, and speak a language; an average life expectancy of only forty years; one doctor for 50,000 inhabitants; a school- attendance rate of only 16 percent; and, finally, a Gross Domestic Product of 53,356 CFA francs per capita, or barely over $ 100. The diagnosis before us was somber. The cause of the illness was political. The cure could only be political. Of course, we encourage aid that helps us to overcome the need for aid. But in general, the policy of foreign aid and assistance produced nothing but disorganization and continued enslavement. It robbed us of our sense of responsibility for our own economic, political, and cultural territory. We chose to risk new paths to achieve greater happiness. We chose to apply new techniques and to look for forms of organization better suited to our civilization. We abruptly and definitively rejected all forms of foreign diktats, thus creating the conditions for a dignity worthy of our ambitions. To reject mere survival and ease the pressures; to liberate the countryside from feudal paralysis or regression; to democratize our society and open our minds to a universe of collective responsibility in order to dare to invent the future…. We swear – we state categorically – that henceforth nothing in Burkina Faso will ever again be undertaken without the participation of Burkinabe. Henceforth, we will conceive and decide on everything. This is a precondition. There will be no further assaults on our sense of decency and dignity. Fortified by this conviction, we would like our words to embrace all those who are in pain and all those whose dignity is being trampled on by a handful of men or by a system intent on crushing them. To all those listening to me, allow me to say that I speak not only in the name of my beloved Burkina Faso, but also in the name of all those who are suffering in any corner of the world. I speak in the name of the millions who live in ghettos because they have black skin or because they come from different cultures, and whose status is barely better than that of an animal. I suffer in the name of the Indians who have been massacred, crushed, humiliated, and confined for centuries on reservations to the point where they can claim no rights and their culture cannot enrich itself through beneficial union with others, including the culture of the invader. I speak out in the name of those thrown out of work by a system that is structurally unjust and periodically in crisis, whose only view of life is a reflection of that of the affluent. I speak on behalf of women the world over, who suffer at the hands of a male-imposed system. We welcome suggestions from anywhere in the world on how to achieve the full development of Burkinabe women. In exchange, we can offer to share with all other countries the positive experience we have had with women who now participate at every level of the state apparatus and in all aspects of Burkina’s social life. Women in struggle proclaim in unison with us that the slave who does not organize his own rebellion deserves no pity for his lot. He alone is responsible for his misfortune if he harbors illusions in the dubious assurance of a master’s promise of freedom. Freedom can be won only through struggle and we call on all our sisters of all races to rise to the assault and fight to conquer their rights. I speak on behalf of the mothers in our impoverished countries who watch their children die of malaria or diarrhea, ignorant of the fact that there are simple ways to save them. The science of the multinationals, however, keeps this knowledge from them, preferring instead to serve the cosmetics laboratories and provide plastic surgery to satisfy the whims of a few men and women whose charm is threatened by the excess of calories in their meals, the richness and regularity of which would make you – or rather us front the Sahel – dizzy. We have decided to adopt and popularize the simple measures recommended by the World Health Organization and UNICEF. I speak, too, in the name of the child – the hungry child of the poor who furtively eyes the accumulation of abundance in the rich man’s stores. The store is protected by a thick glass window; the window is protected by impenetrable bars; the bars are protected by a policeman in helmet and gloves, armed with a billy club and posted there by the father of another child who can come and serve himself, or rather be served, just because he has the credentials guaranteed by the system’s capitalist norms…. In our opinion, we need a serious study that takes into account all of the elements that have led to the calamities that have befallen the world. In this regard, President Fidel Castro expressed our point of view admirably in 1979 at the opening of the Sixth Summit Conference of Nonaligned Countries when he declared, “Three hundred billion dollars is enough to build 600,000 schools a year with a capacity of 400 million children; or 60 million comfortable homes with a capacity of 300 million people; or 50,000 hospitals with 18 million beds; or 20,000 factories to provide employment for more than 20 million workers; or make possible the irrigation of 150 million hectares of land, which with an adequate technical level could provide food for a billion people.” If we multiply these figures by ten – and I am sure this would fall well short of today’s reality – we will see what humanity squanders every year in the military arena in opposition to peace. One can easily see why the masses’ indignation rapidly becomes rebellion against the crumbs thrown their way in the insulting form of aid – an aid often tied to frankly contemptible conditions. One can understand why our struggle for development demands that we be tireless fighters for peace.